It's the end of November already but the garden is still eking out a few last gasps of summer. 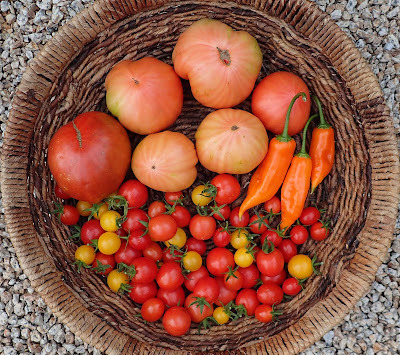 I harvested those tomatoes above earlier in the week when they looked like the tomatoes in the basket below. There's quite a few large green tomatoes still on the vines. I'm not waiting for them to ripen on the vine though, first it's too cold and they color up very very slowly, and second the longer they sit on the vine the more likely it is that the rats will sample them and spoil them. I've been picking them when they start to develop some color which means they are physiologically mature. The flavor isn't quite the same as ones ripened on the vine but they are still quite good. I tallied the ones above after they colored up completely. I'll tally the ones below as they ripen and if they don't spoil. I leave the cherry tomatoes on the vines longer even though I lose a lot of them to the rats that way. Three more Aji Amarillo Grande peppers were ripe enough to harvest. The plant is loaded with partially ripe and green peppers. We are due for the first frost any night now so I'm going to have to harvest the underripe ones soon and put some frost cloth over the plant to try to protect the remaining green peppers. The Tromba D'Albenga squash vines are still trying to make squash and succeeding at times. 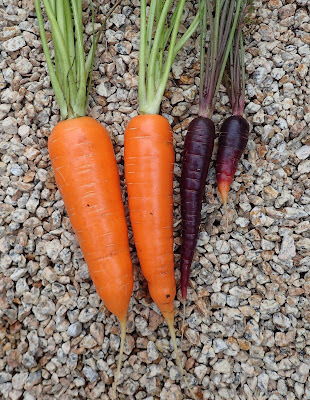 The nice thing about having carrots in the garden at this time of year is that I can harvest them as I need them so I pulled just a few yesterday for making soup yesterday and for a salad today. The celery is still hanging in there also. I'll have to remember to cover them up when the first frost is due so that the stalks don't get ruined. And I spotted one more Honey Nut Butternut squash hanging on the trellis that I had missed last week. Yesterday I was in the mood for soup, so I cooked up some Petaluma Gold Rush beans, and harvested some Tronchuda Beira cabbage, carrots, and celery. All of those went into the pot along with some onions from my stash, frozen tomato paste, and Cotechino sausage. It was just the comfort food needed on a chilly night. And I still have a lot of dried corn from previous harvests in the pantry so I made a batch of cornbread with some fresh ground Cascade Ruby Gold cornmeal and whole Sonora wheat flour. Dave and I were on our own for Thanksgiving this year so we decided to indulge in our passion for backpacking again. That didn't mean that we had a boring trail dinner though. The Backcountry Brussels Sprouts and Carrot Salad that I blogged about last week was more delicious on the trail than at home. And we also enjoyed some delicious brown rice with veggies. Cooked brown rice dehydrates and rehydrates ridiculously well, so I prepared a brown rice dish that also featured dried veggies from the garden (sweet peppers, tomatoes, sweet onion, and sage), plus dried brown mushrooms from the market. And we didn't want to forego the turkey so earlier in the week I made a confit of turkey thigh which I shredded and vacuum sealed. The turkey kept just fine for the one day in the cool winter-like weather. 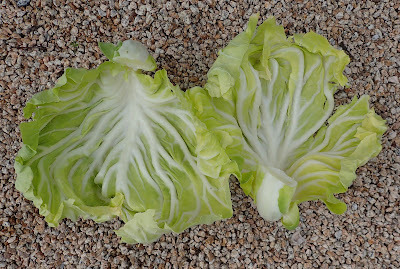 Included in the tally this week is a head of lettuce that I had harvested a couple of weeks ago. It's amazing how well lettuce keeps in the fridge when it is freshly harvested and properly stored. 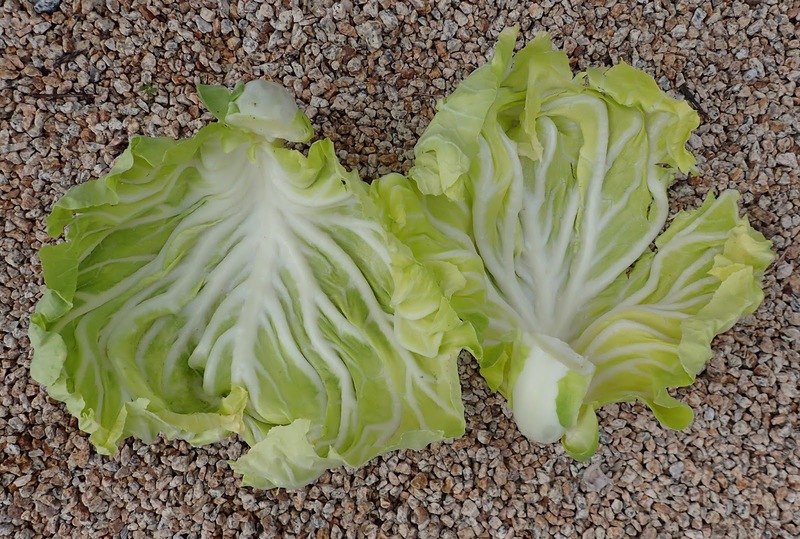 Tronchuda Beira cabbage - 1.2 lb. Purple Sun carrots - 1.4 oz. Rotild carrots - 8.9 oz. 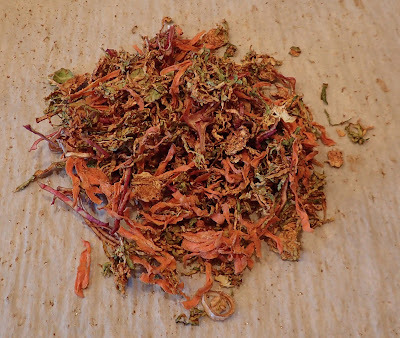 Pink Plume celery - 4.4 oz. Jericho Romaine lettuce - 1.2 lb. Aji Amarillo Grande peppers - 2 oz. Camp Joy tomatoes - 9.2 oz. Piccolo Dattero tomatoes - 4.7 oz. Honey Nut Butternut squash - 8.7 oz. Tromba D'Albenga squash - 1.8 lb. 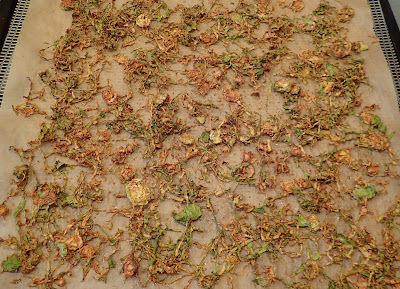 My Harvest Monday post included a shot of some shredded brussels sprouts that were ready to go into the dehydrator. 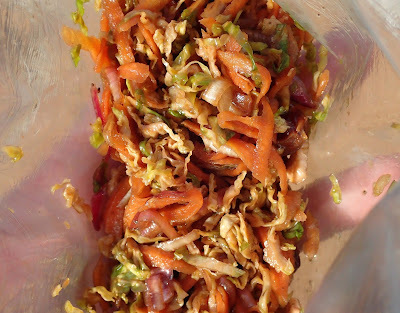 That experiment is one of quite a few that I've been conducting with various vegetables and other ingredients to come up with tasty, healthy, and satisfying meals that Dave and I can take on our backpacking trips. I had experimented with drying the sprouts a few ways. One way was to simply shred them and dry them. First lesson learned from that attempt is that the dried bits will fall through the mesh screen of the dehydrator tray so it's best to dry them on some parchment paper or a silicone mat. The second lesson is that they came out a bit bitter, but that might have been because I was using sprouts that had been in the fridge a few days. My next experiment was to dry whole leaves that had been tossed with salt and balsamic vinegar. Those were really tasty and not bitter, but peeling off individual leaves is a PITA and they took a long time to dry and they aren't practical for packing because they are so fluffy and delicate. What I settled on was a hybrid of the two methods, shredded and tossed with balsamic and salt. And I used fresh picked sprouts too. That method produces really good dried sprouts, good enough to snack on just straight. But I wanted to turn them into some sort of veggie side dish to take on the trail so I am experimenting with turning them into a salad. So I used the same method to dehydrate shredded carrots and thinly slice red onion - tossing them with some balsamic and salt. It's best to dry each veggie separately because they dry at different rates. I dried all the veggies at 125ºF as recommended in the book that came with my Excalibur dehydrator. It only took a few hours, I don't remember exactly how long, to get them to a fairly crisp dry stage. I used part of the results to make an experimental batch of salad, combining the veggies in a heavy duty zip-loc bag as I would do on the trail, adding hot water a bit at a time until the veggies stopped readily soaking up the water and then let them sit and cool. It didn't take long for them to revive to a surprisingly crunchy state, not like freshly shredded veggies, but pretty close, more like a shredded salad left to sit to soften up. I finished the salad with some chopped dried cherries, a dash of red wine vinegar, olive oil, ground black pepper and some roasted salted sunflower seeds. To slice the vegetables use a mandoline to get consistently thick slices so that they dehydrate at the same rate. I have a very easy to use and inexpensive Benriner mandoline (from Japan) that can slice up to 1/8-inch thick slices. For thicker slices I use a big stainless steel mandoline made by Bron in France - it can slice up to 1/4-inch thick. I used cherry flavored balsamic vinegar because I like the flavor of cherries with brussels sprouts, but regular balsamic is fine also. Note also that I did not blanch the sprouts first, they are shredded and dehydrated raw. I used my Benriner mandolin to shred the sprouts 1/8-inch (3 mm) thick. Toss the shredded sprouts with the balsamic and arrange them in a thin layer on parchment paper or a silicone mat on the dehydrator tray. Sprinkle the shredded sprouts with the salt and dry at 125ºF (52ºC) until nearly crisp.I use a few paper clips to attach the paper to the mesh mat that sits on the tray to keep the paper from flopping around as the fan blows over the trays. My old circular dehydrator had fruit leather trays which might work, but I found that food tends to stick to them. Shred the carrots on the coarse holes of a box grater. Then use the same method as for the brussels sprouts. Use a mandoline to slice the onions 1/8-inch (3 mm) thick. Then use the same method as for the brussels sprouts. Store the dried vegetables in airtight bags or jars. To make the salad. Combine the dried vegetables in a heavy duty resealable bag, add hot water a bit at a time until the vegetables stop readily absorbing the water. Seal the bag and let the vegetables sit until they have cooled. Shake the bag every once in a while to distribute any remaining water over the vegetables. When it's time to serve the veggies add some chopped dried tart cherries, a splash of red wine vinegar and drizzle with olive oil. I didn't measure those ingredients, I just seasoned the salad to my taste. Serve with some toasted salted sunflower seeds. 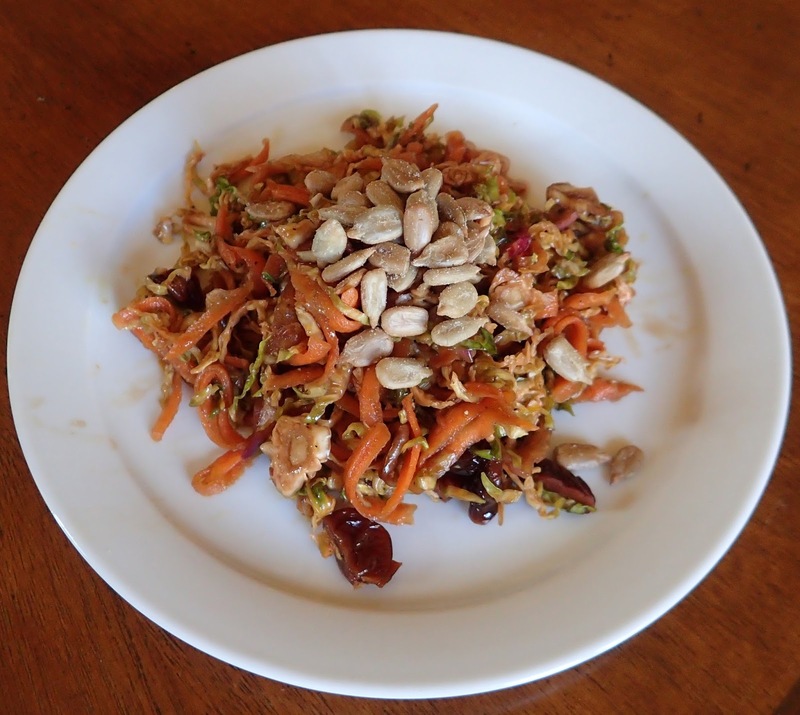 *The fresh shredded sprouts were a bit less that 12 ounces because the stems from the whole sprouts got discarded. I definitely like the way the brussels sprouts rehydrated and I'm going to experiment a but further with the salad, using apple cider vinegar and dried apples for another version, perhaps a bit of cinnamon too. I also like dried currants with brussels sprouts so I will try another version with those and some regular balsamic and some toasted almonds or pine nuts. I think the dried shredded sprouts would also be great used in a warm rice or couscous pilaf. So I plan to write up a few more posts in the future about other dehydrating experiments and back country recipes as I develop them. Happy and delicious trails to you! The unusually nice warm and sunny weather that we enjoyed the first couple of weeks of November has turned damp and the nights have become chilly with one night dipping down to 36ºF (2.2ºC). Daytime temperatures are generally still quite moderate so even though it's wet (yay for rain!) it's still warm enough to keep things growing in the garden. A few more last gasps of summer hit the harvest basket last week. The Baby Aji Amarillo plants produced the bulk of their crop. There was enough of them to put up 11 4-ounce jars of pepper jam. The Aji Amarillo Grande is much spicier than the Baby Aji Amarillos. I used the one pepper, trimmed of seeds, core, and most of the ribs to spice up a salsa that had Dave gasping just a bit. There were a few more large fruited tomatoes that weren't quite ripe but the rats were beginning to sample them so I had to harvest them and use the ones that had been defaced. The DR's are tomato connoisseurs, only the most ripe and tasty ones merit their full attention, otherwise they just take a taste and move on to the ripe cherry tomatoes. But now they are starting to sample the tomatoes long before they are fully ripe so I'll have to start picking the few remaining tomatoes as they just start to turn color. There's still enough cherry tomatoes coming in to keep Dave happy and the rats haven't eaten all of them. That's the final harvest of Reisetomate From Transylvania tomatoes. And there was one more big Tromba D'Albenga squash that got to be quite large even though it hadn't been pollinated. That's most of the Honey Nut Butternut squashes. There were a couple of late set green ones still on the vine so I left those. These little squashes are surprisingly heavy feeling for their small size so I think they're going to be really nice this year. I have 2 Dazzling Blue kale plants. One looks more like the Tuscan kale part of its parentage with greener leaves and less purple in their midribs. The other plant has bluer leaves with very purple midribs. This is actually my first harvest from the more blue plants and it's interesting to note that not only is the color more intense, but the texture is also. The blue leaves are much more sturdy, I don't want to say tough, but they do require more cooking to make them tender. They are still quite tasty in spite of their sturdiness. My big ol' celery plants are still producing stalks and they are still good tasting and not pithy. I've been using it sliced thinly in my usual hearty lunch salads. And the poor snow pea plants pumped out a bunch of pods. These ones got prompt attention and are not going to waste. The Hestia Brussels Sprouts plants are still making mostly funky looking sprouts. They look better after trimming, but a lot of them are still a bit loose. I don't mind too much, they are fine for shredding and still taste good. 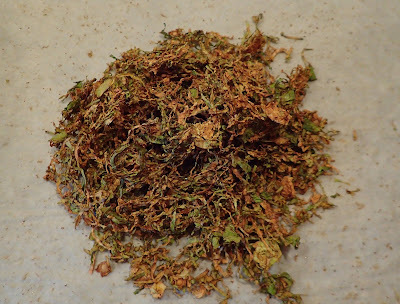 I continue to experiment with dehydrating various vegetables to include in backpacking meals. The Brussels Sprouts are part of my latest experiment and so far the results are surprisingly good. I'm loving the Syrian Medieval chard. This variety is more closely related to early domesticated varieties of chard and their wild forebears. The stems are more thin and green and the plants bolt more readily in warm weather. But the flavor and cooking qualities don't seem to be much different from the other varieties of chard that I've grown. I've been using both stems and leaves and both have been delicious. The plants I started for fall and winter harvests are loving the more cool wet weather and are producing a lot of really nice leaves. I've noticed that the leaf miners don't seem to be attracted to this variety as much as to the more modern Golden and Peppermint Stick varieties that are growing right next to them. As a matter of fact I've not yet found one leaf with leaf miner damage which is certainly not true for the other chards. 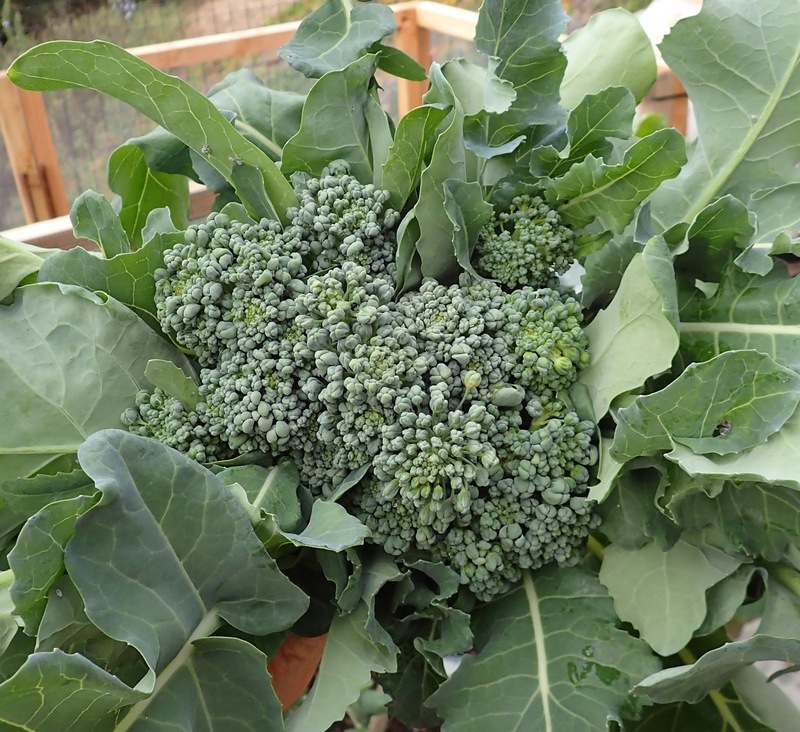 The Calabrese broccoli plants produced another handful of leafy shoots. The leaves are good eating so I cook them up along with the little "heads". The bunch that I had harvested the week before were used to top some bruschetta. I blanched the sprouts with the leaves, then chopped them and sauteed them with some chopped onion and Mareko Fana pepper flakes. I piled the warm broccoli on top of slices of grilled bread with fresh sheepmilk ricotta, with a sprinkle of parmesan and a drizzle of balsamic vinegar over all. That made for a great light dinner one night. I also weighed in another head of the Jericho romaine lettuce that I had harvested the previous week and that I'm weighing as I use it. Calabrese broccoli - 10.7 oz. Hestia Brussels sprouts - 17 oz. Pink Plume celery - 7.4 oz. Syrian Medieval chard - 2 lb. Dazzling Blue kale - 15.7 oz. Jericho romaine lettuce - 9.9 oz. Aji Amarillo peppers - 1.8 lb. Camp Joy cherry tomatoes - 2.5 lb. Mavritanskite tomatoes - 7.1 oz. Orange Jazz tomatoes - 5.9 oz. Panatano tomatoes - 11.4 oz. Piccolo Dattero cherry tomatoes - 17.2 oz. Sweet Gold cherry tomatoes - 9.8 oz. Honey Nut Butternut squash - 10.8 lb. Tromba D'Albenga squash - 2 lb. There's not a lot new to report this week. The weather has continued to be sunny and warmer than usual for the most part. Last night we had a bit of moisture, not really rain, but things got wet and today was more seasonably cold. But no frost yet as you can see by the lush growth of the nasturtiums. I scratched some Kodiak mustard seeds into the area where the Blue Speckled tepary beans had been growing and sifted some compost over. This area is where I'll be growing onions and shallots next year. I will be setting out seedlings in January so I want to have something growing there but I don't need to get a veggie harvest. I probably won't have time to dig the mustard into the soil and have it rot in time by the time I need to plant the onions, but I figure it's better to have something growing than to have bare soil. The mustard can be put into the compost or dug into another area in the garden. The sweet potatoes in the pots aren't dying and aren't really growing either. I'm going to wait until we have a frost to dump the pots and see what's there. I put up a trellis where the Hopi Chinmark corn was and I'm going to try growing some Frieda Worlds Peas which are supposed to be frost resistant and should grow through the winter and produce a spring crop. Last year I grew Golden Sweet snow peas through the winter with the help of some frost cloth and got an early spring harvest so perhaps I'll have a good chance with Frieda Worlds. I cleared out the bean plants from the trellis. This spot is too shaded by the corn to grow anything right now, but once the corn is cleared out I can use this space and the spot where the corn was to grow some winter brassicas. I've been sowing seeds! The flat with the paper pots contains 2 varieties of spinach (Gangbusters and Merlo Nero) and 2 varieties of beets (Golden and Baby Ball). The spinach will go into the spot next to the trellis where I'm going to try the Frieda Worlds snow peas. The other pots contain 8 varieties of onions, Batavia broccoli, and Kolibri & Kongo kohlrabi. Most of the onions are germinating already. I've also got another 4 pots of onions, and 4 of lettuces, plus one chicory, and 1 of Mizunarubasoi. Almost all of the onions that I'm trying are new this year. I'll be writing a post about them one of these days. The seeds of radishes, arugulas, cresses, plantain, and mizuna that I sowed back on the 9th are all germinating, but I didn't take any photos. Other than that I'm still working on clearing out the old stuff from summer, other than tomatoes. I did harvest a nice basketful of Aji Amarillo peppers this week but you'll have to wait until Monday to see them. That's the latest in the garden. Thanks for stopping by. The harvests are an interesting mix of seasons this week. We had rainy weather in October which kept the fall veggies happy and now we are having unusually warm weather which is keeping the last of the summer veggies happy. It isn't often that I get to photograph Brussels sprouts and peppers together in the same basket. That's the first harvest of Gustus Brussels Sprouts and the final harvest of Markeo Fana peppers. And that's the first harvest of Hestia Brussels sprouts. The Hestia sprouts aren't anywhere near as good as Gustus. I tossed a lot of the sprouts directly into the compost because they were very loose and full of aphids. A lot of what I kept were pretty loose also but they were fine for shredding and they tasted good in a quick saute of shredded sprouts with red onion and dried cranberries. And another seasons mixer of tomatoes and peas. I actually ended up tossing the peas because I inadvertently left them out for a few days and they got wilted and lost their flavor. The broccoli is not incredibly productive but what it's producing is very good. The leaves are tender and tasty also so it's almost more a harvest of leafy greens than broccoli heads. I don't tally my herb harvests but wanted to show that the second round of basil plants are still growing and providing some nice harvests. The plants aren't as big and lush as summer basil plants but it tastes great. All of the Jericho romaine lettuce bolted so I cut all the heads and I'm weighing it as I use it. I also tallied the rest of the dry beans that I grew this year. The results were not impressive. Blue Speckled Tepary beans - 14.7 oz. Greek Gigande beans - 1.1 lb. Hopi White Tepary beans - 10 oz. Calabrese broccoli - 8.1 oz. Gustus Brussels sprouts - 11.3 oz. Hestia Brussels sprouts - 13.5 oz. Jericho Romaine lettuce - 1.3 lb. Mareko Fana peppers - 6.7 oz. Jaune Flamme tomatoes - 1.2 lb. Mavritanskite tomatoes - 7.2 oz. Pantano tomatoes - 1.1 lb. Pomme d'Amour tomatoes - 15.5 oz. Well, I'm glad I didn't settle on calling my update posts the Wednesday Weekly Update. I don't always manage to work up a post weekly and more often than not I don't get it done by Wednesday. The garden is sporting more bare patches as fall winds down towards winter. We had a wetter than usual October and now November is turning out to be warmer than usual. But I know from experience that warmer than usual can turn to frosty almost overnight at this time of year. The always productive Romanesco zucchini hit the compost bin recently, that bare corner is where it popped out the zucchinis through the spring and summer. But the Tromba d'Albenga squash vines are now taking over and still producing a squash or a few now and then. The cucumber vines have been stripped off the trellis on the left, just the dying Mouse Melon vines are left now. All the melons this fall were miniature sized. The Crane melon almost looks like a regular sized melon, but not for a Crane melon. The vine is almost dead and the squash has a bit of fragrance to it, but will it have any flavor? I think my experiments with late planted melons have ended, it's not worth the space to produce a few puny melons with less than best flavor. Better to dedicate the space to squash, which is more productive and keeps far better also. The butternut squashes are curing on the vines. There's a slight chance of rain next week so if it looks like it will actually rain I'll bring them in to finish curing on the living room floor where they can bask in the sun during the afternoon. I still haven't harvested the ripening Baby Aji Amarillos yet since I haven't had time to devote to turning them into pepper jam. I think they will keep better on the plants than in the kitchen. This weekend will be busy but I hope to get to them next Monday. Look, the first Aji Amarillo Grande is ripening! I suppose that the 80º+F (27ºC) highs and lows that are staying above 50ºF (10ºC) that we've been enjoying the last few days have helped a lot. The Robin Hood favas are growing much faster than they would had I sowed them in December as I normally do. The tomatoes at this end of the bed have just about finished producing so I'll be removing the sorry looking plants as soon as I have the time and I'll be sowing more favas along the trellis (Extra Precoce Violetto for this space). The rest of the tomato plants are still looking pretty good. There's still quite a few ripening cherry tomatoes. And the rodents are still munching as you can see. Will the warm weather stay around long enough to help these tomatoes ripen? Perhaps this Orange Jazz will get close to ripe on the vine. The Puhwem corn plants are still green and I can't really tell if the ears are going to produce much of anything. It's a race now until the first frost which often comes at the end of November. You can see above where I cleared out the Hopi White Tepary bean vines that were next to the corn and next to that are the stumps of the Hopi Chinmark corn plants. The pea plants are still languishing under their tulle fabric covering. It looks like there might be something in a few of those ears. Yay for I'itoi onions, still growing and growing... And the nasturtiums are happier than ever, at least until the first frost hits. The pole bean plants are definitely not going to produce a second crop of beans, but they are sporting a nice coat of powdery mildew. They are next up for getting cleaned out of the garden. I just can't bring myself to pull out this very happy patch of Climbing Phoenix Nasturtiums that are sprawling all around and up the trellis that was home to the Greek Gigande beans. I have some snow peas that are bred for overwintering that I had in mind for this spot, but how can I cut down those beautiful nasturtiums? Another look at the bare patches where the tepary beans and Hopi Chinmark corn came out. I'm going to sow some Kodiak mustard in the space in the foreground and it will fill the spot until I am ready to plant onion seedlings there in January. I've got some seeds for spinach and broccoli sown to put in the empty spots on the other side of the bed and perhaps some winter type radishes as well, if I can bring myself to pull out the nasturtiums. Over in Bed #4 the Dazzling Blue kale is showing off the Lacinato Kale part of it's heritage. The Calabrese broccoli is looking a bit tatty. The Brussels Sprouts plants are getting to be huge. I started harvesting the first sprouts this week so my goal of having homegrown Brussels Sprouts for Thanksgiving will be met. Although this year we probably won't be home for Thanksgiving dinner. Oh well. On the other side of the bed I decided to get rid of the aphid infested Romanesco broccoli and cauliflower plants. I figured it wasn't worth the battle to get a few measly heads and that the space would be better used for growing winter salad goodies. There were also a few Jericho romaine lettuces that were all bolting that I harvested. That left space to sow seeds of Apollo and Speedy arugulas, Greek and Persian cresses, Buck's Horn plantain, Ruby Streaks mizuna, and a few types of radishes. I'm starting more lettuces in pots that I'll plant out where the last couple of heads of lettuce and a couple of patches of cilantro are growing. Beyond the fabric covered area is the measly patch of parsnips. Poor germination this year means just a few plants in there. Hopefully the extra space between plants will translate to extra big roots. The Russian Hunger Gap kale and Tronchuda Beira cabbage are definitely worth keeping around. And it looks like I'll have plenty of chard to harvest through the winter. Even the last couple of Pink Plume celery plants are resisting bolting and producing some good stalks so they get to stay for a while. That's it for now. Come on by on Monday to check out the Brussels Sprouts harvest.